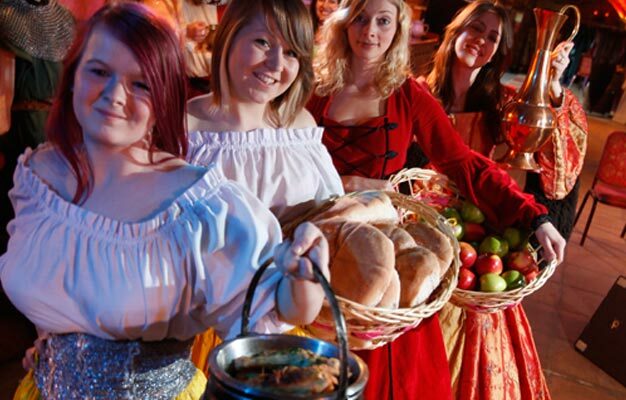 Experience a medieval feast with entertainment at The Medieval Banquet in London. A night full of entertainment, food, music and dance awaits you. Centrally located just two minutes from Tower Bridge and the Tower of London is the historic St Katherine Docks located alongside the River Thames. Come join us and Henry VIII and his knights, troubadours, magicians, jugglers and medieval tumblers for a 4 course meal with ale and wine brought to your table by the dancing wenches. There will be plenty of entertainment and many opportunities to dance, sing and bang your fist on the table and shout for your wench to bring more food and drink! You can see the menu here. 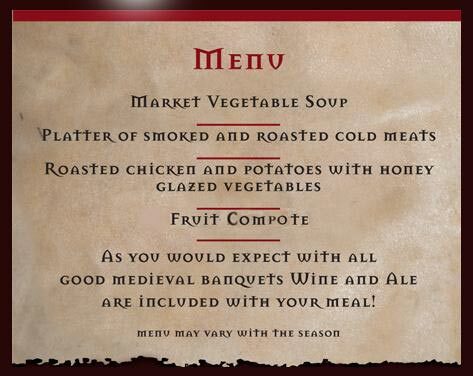 Shortly after your booking is complete your e-ticket will be send directly to your email, just print it out and bring it with you to The Medieval Banquet. What happens between the doors open and the show begins? As a theatrical experience, at 7:45 PM the performers will have taken to the stage. By this point it is adviced that you have found your seats although we do provide for late entry. You may wish to come early to take advantage of the well stocked bar or to hire out a medieval costume or mingle with the other guests. The entertaining and feasting ends at approximately 10:30 PM and we stay open till 11:30 PM. The bar is open and there is music and dancing and you can meet with the cast. The Medieval Banquet is primarily an adult geared venue. However, due to attractive nature of the theme it is appealing to children also. We always welcome children. Yes, children's tickets are available for children under 18. Children under 4 enjoy free entry, when accompanied by a paying adult. Wed. to Sat. at 7.15pm, Sun. at 5.15pm.